Tiny gypsum crystals can make phytoplankton so heavy that they rapidly sink, transporting large quantities of carbon to the ocean's depths. Experts from the Alfred Wegener Institute recently observed this phenomenon for the first time in the Arctic. As a result of this massive algal transport, in the future, large amounts of nutrients could be lost from the surface waters. When marine algae die, they usually float in slow motion to the ocean's depths. 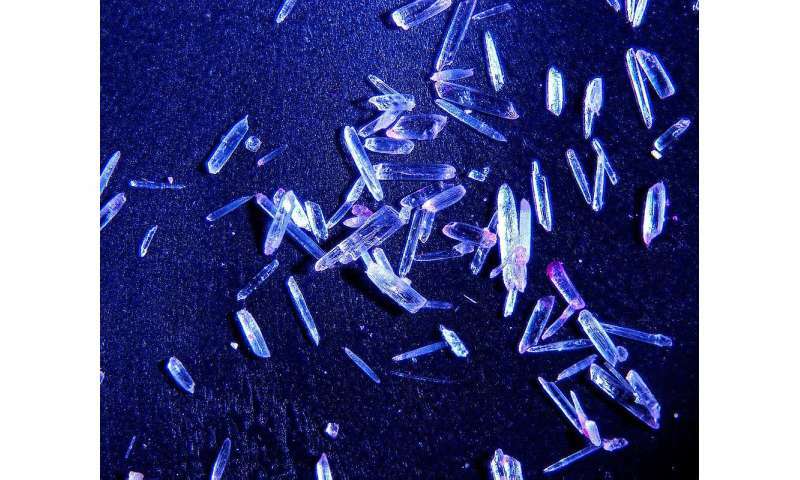 However, during an expedition with the research icebreaker Polarstern to the Arctic in the spring of 2015, scientists from the Alfred Wegener Institute, Helmholtz Centre for Polar and Marine Research (AWI) discovered a phenomenon that significantly accelerates this transport: tiny gypsum crystals, which form during the freezing of salt in the porous spaces of Arctic sea ice, weigh down the phytoplankton like heavy ballast, pulling them to the bottom within a matter of hours. The effect is like an express elevator for the carbon they contain. "This mechanism was previously completely unknown," says marine bio-geologist Dr. Jutta Wollenburg, who discovered the phytoplankton lumps weighted down with gypsum crystals on the seafloor during the so-called TRANSSIZ expedition. Now, together with an international team of researchers, she has published an article in the journal Scientific Reports on this process. "The rapid export of phytoplankton could have a number of effects on the carbon cycle in and productivity of the Arctic, at scales that we cannot yet accurately predict." Just like plants on land, during photosynthesis, phytoplankton take up carbon dioxide, which they use to produce high-energy glucose compounds. In this way, they absorb carbon dioxide from the atmosphere. Once the phytoplankton dies, it begins to sink. Yet only a small fraction actually reaches the seafloor. The vast majority of phytoplankton remains in the uppermost water layers where it is broken down by bacteria, releasing their nutrients and carbon dioxide. In contrast incorporated gypsum crystals apparently drag the phytoplankton lumps down so quickly that there's no time for them to be broken down, causing more phytoplankton mass to reach the seafloor. If these crystals drag down phytoplankton before the bacteria can decompose them, the upper water layers could lose nutrients like nitrate. This could, in turn, affect the marine food web. Nutrients, which are important for the growth of phytoplankton, are scarce; in turn, phytoplankton is the food source for small crustaceans, which are themselves a staple for fish. "However, due to the gypsum transport, more food is finding its way to the usually food-poor ocean depths," says Jutta Wollenburg. "We've already observed how the changed food influx has influenced deep-sea organic communities in the Arctic." As such, this newly observed phenomenon raises a number of new questions. Jutta Wollenburg first noticed it while deploying a multicorer (MUC)—a device equipped with a video camera and used to collect sediment samples from the ocean floor—from on board the research vessel Polarstern. "As the multicorer made its descent, we kept seeing dense lumps of phytoplankton that were sinking rapidly, and we later found many more scattered on the seafloor." Wollenburg was surprised that no other researcher had ever reported such a dense concentration of phytoplankton under a solid sheet of ice at all water depths down to the ocean floor. Using the multicorer, she brought a number of the lumps on board. Under the microscope, she could see that between the algae, there were countless centimetre-long crystal needles. After her return to Bremerhaven, her colleagues took a closer look at the material, which they identified as gypsum. Gypsum consists of calcium and sulphate—minerals that enrich in the porous spaces of sea ice during the freezing process. "We now know that these crystals form in sea ice at low temperatures," says AWI sea-ice physicist Dr. Christian Katlein. "In the spring, when the ice slowly begins to melt, large quantities of these gypsum crystals are released." In this particular case, this happened when the first light of spring penetrated the thinning ice, causing the foam algae Phaeocystis to reproduce rapidly and produce what is referred to as a spring bloom. Thanks to the phytoplankton's sticky surface, the gypsum crystals can adhere to it—until the lumps become so heavy that they sink rapidly. This is remarkable, according to Wollenburg, because climate change means that sea ice, which is now mainly first-year ice, is increasingly melting in spring. Accordingly, in the future, further gypsum crystals will likely be released at the time of the spring blooms. Furthermore, the sea ice becomes increasingly fragile and thereby more transparent. This leads to extended under-ice algae blooms. 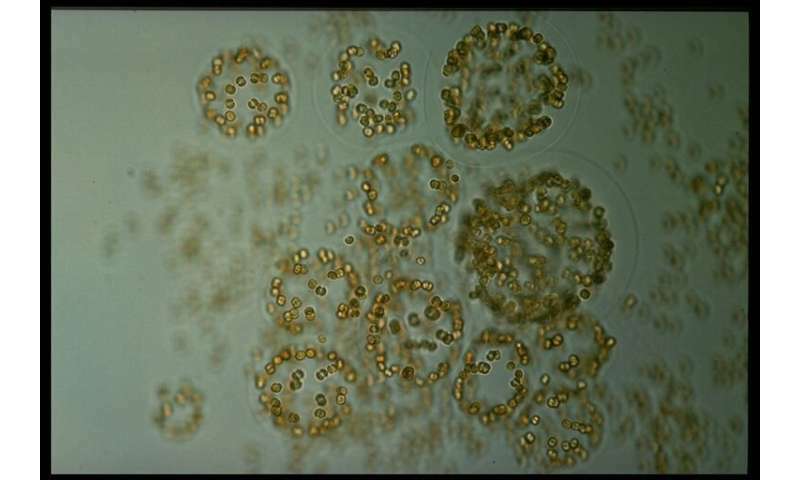 Phaeocystis can thrive with comparatively little light. "As a result, the two phenomena—the blooms and the release of gypsum crystals—may in future coincide more often," says AWI sea-ice ecologist Dr. Ilka Peeken. "If they do, considerable quantities of phytoplankton mass could sink to the bottom of the sea floor." This could have consequences for life in the waters of the Arctic: "We may see a lasting decrease in the nutrient concentration in the upper water layers, which could eventually affect the number of fish, and with it the fishing industry in the region," says Jutta Wollenburg. Another question is whether the phenomenon of accelerated algal biomass transport might not actually bring more carbon to the ocean floor, where it will remain stored for several hundred years. Experts also refer to this mechanism as the "biological carbon pump." "It's a distinct possibility that, in the same way, more carbon is finding its way to the depths of the Antarctic Ocean than has been assumed to date," says Wollenburg. Accordingly, she and her colleagues now plan to more closely analyse this process in the polar regions.